Behind the glamour and glitz of high-profile hotel projects, like the W Hotel in Hollywood and the SLS Hotel and Casino – Las Vegas, are George W. Ekins and Joseph C. McCarthy. Neither celebrities, nor developers, Ekins and McCarthy are the two principals of the American Dream Fund (ADF) family of regional centers. The two run ADF to identify EB-5 compatible projects and match them with foreign nationals looking to invest capital and immigrate to the United States. They may be two of the youngest regional center operators in the business, but that doesn’t discourage them from being ambitious. Their SLS project, at the site of the Sahara hotel on the Vegas strip, is one of the biggest projects affiliated with EB-5 capital. Jointly owned by SBE Entertainment and Stockbridge Capital Group, over 30 percent of this project’s funding comes from EB-5 investments, organized by the team at ADF. Those investments translate to over 600 I-526 petitions filed and about 360 thus far approved. Construction began on this project in February 2013, and the hotel is scheduled to open on Labor Day weekend of this year. So what has led Ekins and McCarthy to this level of success? Insights into their personal backgrounds and business philosophy can suggest answers to this question. Ekins and McCarthy’s partnership dates back to a friendship developed as undergraduates. The two remained in touch as careers and education took them in different directions, even internationally, before their professional paths crossed again: McCarthy worked with the Governor of Washington in the Executive Policy Office, and Ekins was managing family trusts in commercial real estate. Then, in their mid-to-late 30s, the two started American Dream Fund, and the company opened its first regional center in Los Angeles in 2009. More regional centers quickly followed—one in Las Vegas in 2010, another in Portland in 2011, and the most recent in Orlando in 2012. Like many in the EB-5 industry, their paths to careers in EB-5 were not entirely linear, though their previous professional experiences have contributed to the success of ADF. Ekins originally pursued a career in international business; he previously lived in China and Taiwan, operating manufacturing facilities and managing international exports. McCarthy earned graduate degrees in both engineering and law and, following a career in government, relocated to southern California, where he co-founded McAdam & McCarthy. It was their combination of McCarthy’s legal prowess and EB-5 knowledge, and Ekins’s experience living in Asia and working in real estate, which led them to EB-5 success. Perfectly poised for EB-5, Ekins and McCarthy embraced the opportunity to use the program to help fund one of the biggest projects in the industry to date. ADF’s involvement in the SLS hotel began when Stockbridge approached the duo with the project and an interest in using EB-5 funds. Stockbridge had researched the EB-5 program, was interested in using the financing method, and wanted to find the appropriate team to head the EB-5 raise. The company was looking for the regional center that would best represent the project and be able to manage the raise on the EB-5 side. Ekins and McCarthy agreed to this particular project only after thorough due diligence, and a background check of Stockbridge’s long track record, financial resources, credibility, and history of similar projects. After a long dialogue, ADF worked with Stockbridge to structure the project to be EB-5 friendly, which meant setting up a loan model that did not require EB-5 investors to be involved in the day-to-day matters of the business. EB-5 investors provided capital flow to the project by investing in a special purpose entity (SPE) set up by ADF to loan funds to the SLS project. As such, investors are able to fulfill the program requirements with minimal actual involvement in the business. While EB-5 funds make up about 35 percent of the total investment in the project, this structure is indicative of a wider trend to view EB-5 investments in real world business terms—as just one part of a successful capital stack. EB-5 funds work in concert with other loaning parties and private equity brought in by the owners of the project. A key strategy in the SLS deal was conducting due diligence beyond the minimum required for I-526 petitions. ADF used 3rd party verification to do their own economic reports, and ensure that the project was EB-5 appropriate. This was necessary not only to gauge the probability of the project’s EB-5 and financial success, but also to market the project to foreign investors, who want to make sure the project is right for them before signing away such a large investment. However, Ekins and McCarthy also acknowledge that they do not have to perform due diligence all on their own. By working with the trusted brand names of Stockbridge and JP Morgan on the SLS project, they can also rely on the due diligence of other players. These big names are not only just as invested in the SLS’s potential success, but also have a lot of practice conducting due diligence and can be trusted as a reliable source. ADF was initially attracted to the project because of Stockbridge’s involvement with retirement funds. Ekins and McCarthy felt that this showed a mutual understanding of these investments as having a defining effect on people’s lives. Ekins and McCarthy say that they “do lose sleep over the idea that someone is entrusting [them] with their immigration status.” Stockbridge’s history with retirement funds signaled to Ekins and McCarthy that the group knew how to handle accounts motivated by more than just profit, and ADF felt they had a strong commitment to the EB-5 investor. This not only gave ADF confidence in the project, but they also knew that it would make it more marketable to investors. Although the project was backed by reputable sponsors, Ekins and McCarthy nonetheless encountered difficulties marketing the project abroad in the wake of the controversy surrounding A Chicago Convention Center. Potential EB-5 investors became understandably cautious of the program, which made it much more difficult for ADF to get these investments. 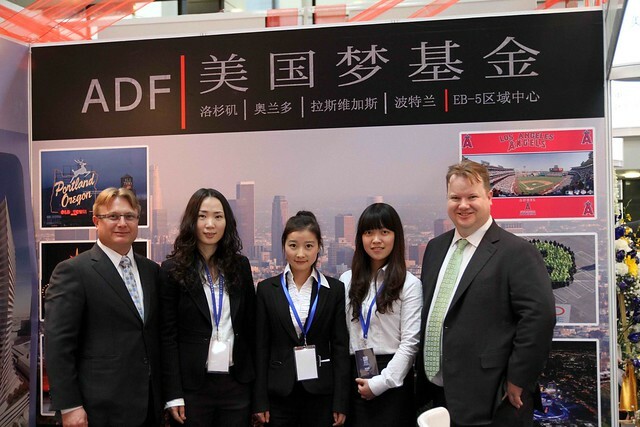 However, be- cause the project was built on a strong foundation with reputable players, and had been adequately vetted for EB-5 compatibility, ADF was able to bring in over 600 interested investors. Because they had conducted due diligence, they were able to ensure, from the very beginning, that they were choosing a project that would be attractive to investors. The American Dream Fund is not represented by the SLS project alone, but the SLS deal is quite representative of their general way of operating within the EB-5 realm. ADF defines its practices as “social entrepreneurship”—business that maintains private interests while still contributing to the public good, a concept that mixes well with the similarly win-win situation of the EB-5 program. They dedicate themselves to EB-5, and unlike other regional centers that only work on a few EB-5 projects mixed in with other development endeavors, Ekins and McCarthy deal only in EB-5 investments. Because EB-5 is their primary business, Ekins and McCarthy have focused their energy on the program and all its moving parts; they even make sure to educate all of their staff so that everyone in the office knows the basics of EB-5 and can answer questions on the subject. This level of concentration is likely partially responsible for their quick rise to success. Ekins and McCarthy look at every project that comes across their desk with a critical eye and say that they “turn down probably 99 out of 100 projects” because they are not right for the program. In order to select EB-5 appropriate projects, they maintain a philosophy of low risk-tolerance. This patience not only helps them select financially promising development, but also help fulfill the goals of their foreign investors, for whom the EB-5 program has such high stakes. ADF acknowledges that a lot of interest in practicing immigration law originates from the desire to help people, and working in EB-5 is no exception. Most of ADF’s clients are primarily interest- ed in providing a better future and a U.S. education for their children while protecting their investment, and Ekins and McCarthy see the EB-5 program as the perfect path. It is the understanding that investors are people with families and stories, and not just as “an anonymous capital source,” that drives Ekins and McCarthy to strive to operate responsibly within the program. Another aspect of human connection, and project success, is ADF’s practice of having staff devote time, one-on-one, with their investors in China, if possible. They provide their potential inves- tors with the documentation they need to trust in the project, and are willing to meet and re-meet these foreign nationals to answer questions and address concerns. Ekins and McCarthy want to give them a “transparent picture of what they’re getting,” and employed this strategy when marketing the SLS project abroad. Ekins and McCarthy say that the American Dream Fund now has “trusted brand recognition.” If the SLS hotel project succeeds, and more of its related I-526 petitions and subsequent I-829 petitions are approved, this recognition will only grow. Ekins and McCarthy say that when it comes to EB-5, “success of a project is more than critical—it has to happen.” Not only is a huge amount of capital on the line, but also the green cards, and futures, of hundreds of EB-5 immigrants. For anyone involved in EB-5, keeping an eye on the SLS project is a must.